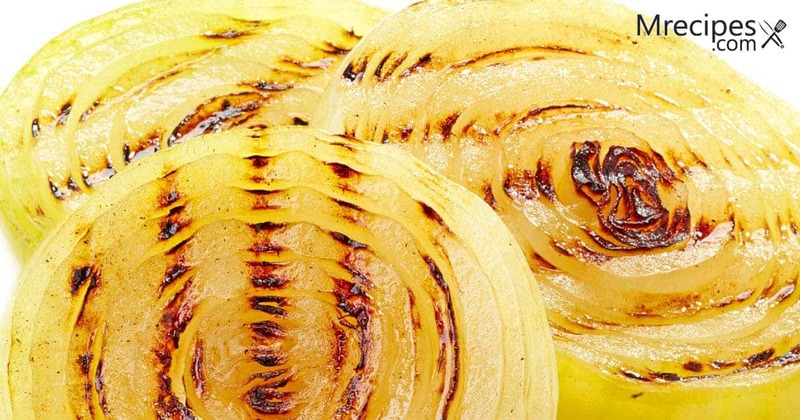 Grilled onions are one of the easiest vegetables to prepare, and the flavors are incredible. There is something about a charred onion that makes any dish taste better. When you grill onions on a George Foreman Grill they become soft and sweet. Did you know that onions have natural sugars in them? They are also high in water content. The natural sugars help the onions to caramelize when grilled. The water keeps them moist. Onions are free of fat, cholesterol, and sodium. They are a high fiber food and provide a decent amount of vitamin C and manganese. At a mere 45 calories per serving, onions add abundant flavor to a wide variety of dishes, especially for those of us watching our waistlines. Let’s explore a basic grilled onion recipe and what to do with them after grilling. You can use any sweet onion that is available in your local grocery or farmer’s market. Sweet onions tend to be somewhat elliptical in shape with more surface area than rounder onions when sliced. And, they are inherently sweeter than yellow, white, or red onions, making them perfect for caramelizing on the grill. Onions don’t need any seasoning when grilling, just a little oil. 1. Heat your Foreman Grill to high for approximately 5 minutes. 2. Slice the root end of the onion off. Peel back the skin to the stem end to reveal the white flesh. Slice the onion into 1/4 to 1/2 inch solid rounds. 3. Coat both sides of the onions generously with EVOO. 4. Place the rounds on the grill and close the top. Cook for 5 minutes. Then, carefully flip the onions with a spatula so that they remain intact. Grill for an additional 5 to 7 minutes. The flat surfaces will char and get black grill marks, and the centers will be soft but not mushy. 5. Remove the onions to a cutting board and either serve whole or in rings. If adding to another dish, chop the onions to the desired size for the recipe. I like onions just the way they are with a sprinkling of sea salt and some freshly ground pepper. I also like to add grilled onions to other dishes because of the sweet smoky flavor they add. A great use of grilled onions is in an upscale grilled cheese sandwich. Onions and cheese go well together, in my opinion. While your grill is still hot, try this grilled cheese recipe. I happen to like this sandwich with cheddar cheese, but Emmental works really well too. I also prefer whole grain bread for the nuttiness and health benefits. Gluten free whole grain bread works fine. If you like white bread, that is really okay too. The prosciutto adds a nice salty element. 1. Heat you Foreman Grill. If it has the option, heat it to medium. 2. Butter both sides of the 4 bread slices. 3. Place a slice of cheese on 2 of the slices of bread. Add 2 slices of prosciutto on top of the cheese. Top that with the chopped onion. Add another slice of cheese and top of the onions. Place a slice of bread on top of each assembled sandwich. 4. Grill with the top closed for 3 minutes until the bread is golden brown and the cheese is starting to melt. While I did this on a basic grill, you could use the Foreman Panini Grill. I tried this sandwich on the 4th of July because I had leftover grilled onions from a fireworks party I hosted the night before. The onions were a huge hit served with other roasted and grilled vegetables. Some of my guests were skeptical about onions on a grilled cheese sandwich when I mentioned it. They had a few suggestions that would elevate this sandwich. The first suggestion was to make it a little sweeter by adding a smear of fig jam. That sounded pretty good. Here is a simple fig jam recipe from 52 Kitchen Adventures. Or, you could just buy a good jar of your favorite preserves. The second idea was to serve the sandwich with a tomato or fruit chutney on the side that you could just dip the sandwich into with each bite. Jamie Oliver has a really simple tomato chutney recipe. Tomatoes, onions, and cheese are a terrific trio. On that train of thought, this sandwich would pair nicely with a steaming bowl of creamy tomato soup and a good beer or stout. That sounds perfect for a fall afternoon. Remember, with the Foreman Grill you can have grilled onions any time of year. Sweet onions peak in the summer, but they will keep for a few weeks if stored properly.